During the move back to WordPress.com, I lost a few postings that are part of my history as a blogger. I recovered this from an old abandoned Blogger account…gotta love the Internet. This is “ancient” but still fun to read. I’ll grab more and post them here. “ooVoo” was introduced a few months ago, and the INSTANT Yeoldetechy loaded it and tried it, I was hooked! ooVoo has, in my opinion, the capability to finally meet the ideal of providing easy-to-use visual interactive communication for everyone. Truly a great application! 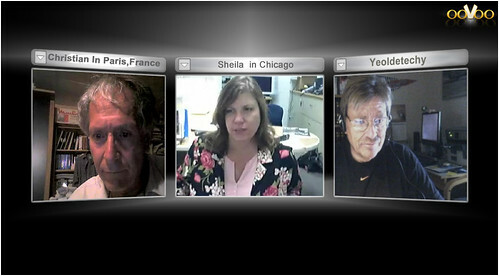 Yeoldetechy has been evangelizing, and using, “desktop videoconferencing” since 1992 (see www.telbitconsulting.com web site for scanned and uploaded articles from years past). Since that time the world of desktop videoconferencing has evolved from telephone-based systems (Integrated Services Digital Network, ISDN) that cost over $5000 to Internet based systems needing only a web cam and ranging in cost between FREE (for non-standards based) to less than $200 for standards based systems (these allow interoperability with videoconferencing systems in use at corporations, schools and universities). In the old days, Yeoldetechy was dead set against products that were not based on the standards. Why introduce a product that was not interoperable with the rest of the world? Some very large companies did exactly that. And their products died. However, the Internet has changed everything. Now, products for videoconferencing can be proprietary and still be standards based. Yeoldetechy says: The Internet is the standard. What do you need to use ooVoo? First, you need a DSL (digital subscriber line) or cable modem Internet connection. These give you connections to the Internet at the higher “upstream” speeds required for videoconferencing. By “upstream” I mean the signal going UP into the Internet cloud. This needs to be at least 256,000 bits per second (256 kbps). Using a tool such as SpeakEasy (http://www.speakeasy.net/speedtest/) you can test your upstream speed (see Yeoldetechy article on WiFi hot spots to be posted in a week or so). Wireless networks in the home work fine, again, see the WiFi Hot Spot comparison for more information. Second, at the present time (as of this writing, the Mac version is in “closed” Beta testing, availability expected in Fall 2007), you will need at least a 1 GHz Windows based PC running XP or Vista with 20 megabytes (MB) of hard disk space and 256 MB of RAM (random access memory). Ideally, this machine should be as fast as possible, but, mine (a Toshiba laptop) is working at the specified lower limit and it works just fine (see pics of the Three Amigos in a meeting). As an aside, in one of the pictures you see Christian in Paris, France. He is connected using a Mac that, using VMware Fusion, was working alongside the MacOS X. The video worked fine, but his audio did not (but realistically that could have been caused by any number of factors). The other features discussed below all worked fine. Third, and last, you will need a web cam, and if you want to avoid echoing, a headset. I am using a Logitech 4000 and it works just fine. Many times I do not use the head set (also from Logitech, www.logitech.com), but, the quality of audio is much better with it. My headset plugs into the laptop’s mic and headset ports…it is NOT a USB headset (although I do want to get one and try it). Installing ooVoo is as simple as visiting their web site and downloading the application. The installation takes a few minutes and worked without any problems. This is where ooVoo makes life very interesting. The integration of instant messaging (IM), file transfer capability, video mail, and, video & audio conferencing in a single package is terrific. Add extreme ease-of-use on top of that, and ooVoo is a product that has the capability to change the way we live and work! An added benefit is that you can call friends for “free” using ooVoo. The idea of “presence” has become well known in the past few years as instant messaging has become more popular. In the old days, you made a phone call and more times than not the person was not around to accept your call. Now, with IM, you know if the person is there, or not. Very efficient. With ooVoo you can fire up a chat session to see if your “buddy” can accept a video call, or you can just video call them. Your choice. If all you needed to do was send a file, you could do that as well. You can chat with one person or the whole group and you can decide what picture to show for each buddy or yourself. For example, I have chosen to show our Yellow Lab, Sunny, since he is far better looking than Yeoldetechy. One possible “bug” (?) is that, in a multipoint call, I could see an indication that one participant was “typing” but never received a chat message. For the suspicious in all of us.. If that was not a fluke occurrence, ooVoo may want to fix that. While in a call one participant can send files to one other participant or to the entire group. The file transfer is maddeningly slow, but, on the bright side it tells you it will be slow. In the multipoint call with Christian and Sheila, Sheila fired up a file transfer to all of us. During the course of the 15 minutes it took to get to us, Christian (because he was testing the Mac in Windows mode experiment) was in and out of the meeting. When the file was finally transferred, he got the file as originally planned. VERY cool. An interesting feature is the ability to produce a video mail. An ooVoo user can view the video mail in ooVoo while non-ooVoo email recipients can view the video mail via a stream. The max length of a recording is 1 minute. Since video messages tend to be short, this is not a problem. The ability to send a video mail has been around for quite some time. The interesting aspect is that the ooVoo video mail is “streamed” to user. The difference is this: with the old method the recipient needed to download a very large file to their computer then play it. With a “stream” the user watches the video mail like they watch a YouTube video or a news video in the Internet, the video mail starts to play instantly (well…almost) and when it is over, no copy is left on the recipient’s computer. The definition of streaming. VERY nice. A couple of irritations when producing a video message. The window says to press “Record” to record. There is no button specifically labeled “Record”. There is a big Red button that when moused over says “Record”. Pressing that starts the recording. To stop the recording you have to press another button which is blue. Use the same button to start and stop the record. In other words, use that button in toggle mode. In my mind (and I may be wrong) Green means start and Red means stop. As I have mentioned the video and audio quality is every bit as good as a desktop videoconferencing product you can purchase. The difference is the lack of standards based H.323 interoperability. This means that if you are a TeleWorker and need to communicate into a Conference Room H.323 system or into an MCU (multipoint control unit) to attend a meeting, you cannot do that with ooVoo. Does Yeoldetechy want ooVoo to implement H.323? Not really. If a person needs to do H.323 they have choices. If ooVoo implemented H.323 it could open up new avenues, but, it could also bloat the application and complicate it (need to enter gatekeeper information, calling via E.164 number, or IP address, etc. etc.). Yeoldetechy says: Keep ooVoo simple, fresh, and new. In a video call, you can select one person to fill the display. This is a nice feature that was introduced in the latest software version. 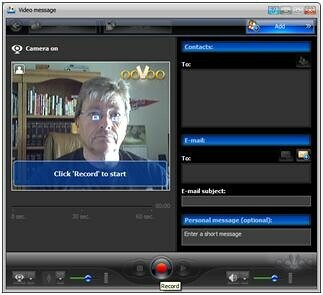 ooVoo has implemented security features to stop the random person from contacting you. They have implemented, as a default, the higher security of allowing only contacts to contact you. As you become more comfortable with ooVoo you can open up the security. ooVoo login consists of a login and password that you select. Yeoldetechy is not sure if that login and password is secure (i.e. like https) or not. I can check. Firewalls? Interesting question. 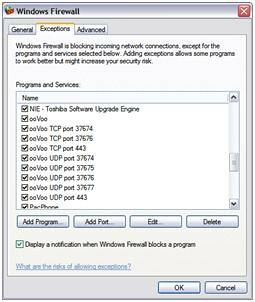 Looking at my Windows XP firewall information ooVoo opened up several ports. See the pics. This may be an issue for those who have firewalls at work. This is not surprising since this is a common “weakness” of H.323 standards based products as well. Yeoldetechy says: When planning to use videoconferencing over the Internet, especially at work, make friends with the network and security folks. I hear they like donuts. ooVoo has other features that I have tried or will try as time permits. You can form a group and you can block unwanted callers (and manage those blocked callers). You can also add ooVoo to your blog or MySpace account so people can call you easily from those locations. Try as I might, I cannot find out how this is done. There is no information on the ooVoo Web Help Site, that I can find, and there is no apparent menu option in ooVoo. You can set up a “favorites bar” with up to six of favorite buddies. This allows you to communicate easily with these people. All I need is more friends…. One feature that is not included, and one that Yeoldetechy would like to see, is a call status capability. For example, I want to see the call bit rate, and preferably have the ability to change it manually. Also, when sending a file, the bit rate, when video is being used is rather slow (hmmmm, VERY slow). Yeoldetechy would also like the ability to crank that speed up. On the video side, ooVoo has implemented a robust set of features in their latest release. One additional feature they may think about that is the ability to turn off your picture while in multipoint (more than two people) mode. If as shown below, I could only see Sheila and Christian….that would be an improvement. Ah…the big question. Will ooVoo remain a free service? I suspect it will, and that advertising will occupy space on the user interface. But who knows…maybe we can get ooVoo to respond to this question? How will ooVoo support the masses? Once ooVoo has become a household name, it remains to be seen how support will scale to thousands of simultaneous users while maintaining video and audio quality. Embedded in Kyla’s response were some future features planned for ooVoo. ooVoo will be running non-intrusive, interactive advertising. Yeoldetechy says: Sounds like a bright future! The time for video collaboration has come (finally!). If you Telework, this is a great way to stay connected. If you are a teacher, then you can bring in experts from around the world to talk to your class . If you have family in other states, or kids at school, you can stay connected! ooVoo can be the application that makes video collaboration commonplace.